A new study led by Dr Nick Higgs, Deputy Director of the University of Plymouth’s Marine Institute, has revealed how one fifth of the Caribbean spiny lobster’s food comes from a process known as chemosynthesis. Chemosynthesis is the biological production of new organic matter using energy from chemicals in the environment rather than energy from sunlight (photosynthesis). Microbes are the only organisms capable of this alternative form of food production – also known as dark carbon fixation – but some specialised animals have formed partnerships with chemosynthetic microbes to help them obtain their food. Lucinid clams are one such group and are particularly abundant in tropical seagrass beds, where, as the research has found, they are a major food source for the lobsters. said Dr Higgs, lead author of the study published in the journal Current Biology this week, and funded by the Natural Environment Research Council and British Ecological Society. Previous studies had looked at the gut contents of the lobster and had found no indication that they feed on the clams, most likely because they do not consume the shell. But studying lobster specimens in the Bahamas, and conducting chemical analysis at the NERC research facility in East Kilbride with Dr Jason Newton, the team at Plymouth found ‘fingerprints’ of the chemosynthetic clam. Chemosynthetic production is usually thought of as a deep-sea phenomenon, where it supports lush animal communities around volcanic vents and hydrocarbon seeps. Scientists have recently begun to realise that it can be important in some shallow habitats too and this is the first time that chemosynthetic primary production has been shown to be support commercial fisheries. In this case it sustains lobster production worth more than US$17 million to the Bahamas fishery alone, and potentially even more to the Caribbean region as a whole. Indications from studies in Australia and New Zealand also suggest that chemosynthetic inputs to lobster fisheries could be a global phenomenon. Spiny lobsters grow to around one foot in length, weighing 1—3 kilos, and are believed to crush the edges of the clam’s shell before extracting the meat. 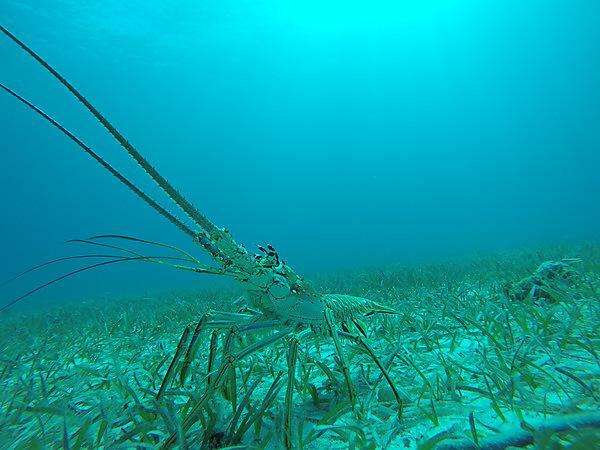 The paper, “Caribbean Spiny Lobster Fishery is Underpinned by Trophic Subsidies from Chemosynthetic Primary Production”, is available via the link below.